You can see the previous golf mastery articles here. Back the the 13th hole. I was now 5 down with 6 holes to play. It wasn’t ideal that’s for sure, but where there’s life there’s hope. I took my 7 iron, aimed to the left, hooded the club slightly and swung freely. The ball came off low and with the right amount of hook spin. I knew right away it was a good one. The ball finished close and the few spectators gave me a little golf clap. It was the last shot I hit on that hole. My opponent first visited the swale and then the drop off at the back and conceded the hole. I was now 4 down with 5 to play. Pitching the ball has never been the strongest part of my game. In fact, many of my golfing mates would say it has been a weakness. But I’ve gotten better at it, and some days I have managed to pitch the ball quite well. It will never be the best part of my game, but I reckon it’s now acceptable. The 14th is a par 5 and I had to lay up because I missed the fairway – found one of two enormous fairway traps. I had around 80 metres left in for the approach and hit one of my most memorable pitches ever. The pin was located behind the front bunker, on the right hand side. This green is notoriously fast and going long isn’t an option. Once again, I aimed out to the left and hit a draw shot. This time the ball flew off with extra spin, landing short and left of the pin, then took a bounce forward and spun back and to the right. When all was said and done the ball was 4 foot below the hole. It was the perfect shot and I followed that up with a nice putt. I was now believing. Sometimes you need some luck and you have to be ready to take it. You can’t let some good fortune sidetrack your focus or performance. My drive on 15 was out to the left and looked for all money I’d be in the trees. The luck was that the ball dropped down, giving me a swing but still needing to hit a massive slice to find the green. By now Adam was feeling the pinch. He’d lost three holes in a row and could feel my confidence growing. He did the wrong thing off the tee – he found the deep fairway bunker, the only spot that was dead. From here he was certain to make nothing better than bogey. I recovered to the front of the green, hitting a huge slice around the trees, and then watched Adam play an ordinary 3rd. He was certain to make 5. I was left with a massive putt on the largest green on the course. My ball found the very front of the green and the hole was located at the very back. The early part of the putt was uphill and then from the middle it swung to the right and downhill. The green was big and lightning quick. It wasn’t an easy putt. The putting yips might be the worse thing that can happen to a golfer. When you stand over a short putt and you know you’re going to miss it before you take the club away is not a good feeling. There is probably nothing worse in the sport. You’re confidence is completely shot and no matter how hard you try you never are able to make those shortish putts with consistency. 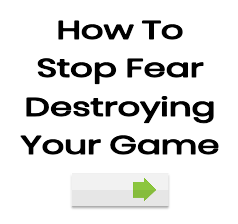 Then, your entire game is riddled with fear. You feel pressure on long putts because you know if you don’t get the first putt close you’re likely to 3-putt. You get anxious on all short shots because you feel added pressure to get the ball really close to the hole. Your iron play becomes too deliberate and and you steer the ball. When you miss a green you are almost certainly conceding defeat, knowing that your game is NOT ready to be relying on your short game. So your game spirals out of control. You start despising golf and dread taking the putter out of your bag. Thoughts of poor putting, embarrassment, fear and wasted opportunity consume you. Welcome to the horrible world of the putting yips. I can almost pin point the day when I first experienced the putting yips. It was 1997 and I was playing in a local weekend competition. At this point I was making some waves on the golf scene. I was a decent player, had managed to win a few events and was sort of consistent. My game wasn’t totally reliable (I was still working things out) but I was doing ok.
By this time I was good enough to be taking lessons with some of the better coaches around town. This was the done thing (probably still is), you book in for a 30 minute lesson, have your swing put on video, receive some drills and then finish off hitting balls. You’re in and out – almost like a production line of wannabe golfers who are trying to figure out the best way to hit that white ball into that small hole. During that week of 1997 I had my only putting lesson. I can’t remember why we did putting, but it was a break from the normal stuff of stance, grip, backswing or body pivot. I was always a good putter – I had a short and sharp jab motion and would give the ball a fair rap. When I was on I was able to hole all sorts of putts from all over the place. Missing short putts wasn’t an option. On this day the coach told me my stroke was no good. I had to take the putter back “low and slow” and find more rhythm. He told me that none of the good players had short and sharp putting technique (it’s funny how many of the old time players did though) and that I’d have to change if I was going to be any good. So we spent the 30 minutes on the green trying to find a better stroke. It wasn’t too hard and by the end of the lesson he said I had the makings of a better technique. I used to love practice. I could spend hours doing drills and hitting balls – I was determined to do whatever it took to become a better player. I would do anything the coaches told me. I was the ideal pupil – I did what I was told and never questioned them. For the rest of the week I spent hours on the local putting green. It was a public course and they had this amazing golf green for practice. It’s no longer there (it made way for a Pro Shop extension) but a heap of the local players would congregate there, talking golf, putting and sharing stories. The green was huge and if you were a keen been like me, would keep you entertained for hours. My stroke was coming along and by the weekend I was confident of performing well in the tournament. I warmed up and made my way to the first tee. … my first putt only traveled half way to the hole. I didn’t hit it hard enough. These greens were really slow. 3 putt. I was also trying hard to implement the new stroke. Low and slow. Low and slow. By the turn I had had over 20 putts. I was three putting everything and was well and truly out of the tournament. And it was annoying, it was a fairly easy course and I should have been dominating. Then it got worse. By the 12th I started to feel awful over all the putts. It was a strange and really uncomfortable feeling – I just couldn’t take the putter away from the ball, and when I finally managed it, the stroke was terrible. I was putting like a rank beginner. Didn’t hit the hole from 3 foot on 12. Missed another gimme on 13 and three-putted 14 and 15 too. This was a nightmare. If it wasn’t so serious it would have been hilarious. I’m sure my playing partners thought it was funny, but I was in a state of shock. I didn’t know what to do. On 16 (a par 5) I ripped two incredible shots onto the green to 4 feet. The first putt didn’t hit the hole and I yipped the second so badly that I thought my body had developed some sort of terrible twitch. I tapped in for an “easy” par and then felt like crying. I had managed to destroy my putting game in a week. Trying to change my stroke was a stupid idea and then practising on a slick green, only to find a slow putting surface for the tournament, was enough to send me over the edge. Instead of thinking about the target and how to plot myself around the course, I was panicking at the thought of having to putt. It was ridiculous and to that point the worst experience I’d ever had on a golf course. I was a yipper for many years and they certainly dominated my thoughts. I had trouble sleeping and I’d often wake from bad dreams about missed putts and embarrassing myself. At the peak of this infliction, I’d even feel yippy watching other golfers putt – I’d miss a heart beat if a golfer missed a short putt. It took me years to battle my way out of it. I tried everything from new putters to changing my technique. I putted looking at the hole and with my eyes closed. Nothing worked. In desperation I even putted with a 2 iron in an attempt to short circuit the effects the putting yips had on me. In 2004 I traveled to the USA and spent some time with Aaron Baddeley – we played at the same golf course in Melbourne and I was one of the few golfers who could give him a run for his money. Aaron hosted me for a few days and we played some golf. Aaron was already a star – he won the Australian Open as an amateur and backed that up by winning it again the following year as a professional. He was now playing on the PGA Tour and was having some success. My putting game was still pretty bad. I felt nervous over the short putts and was always happy to avoid 3-putting. Aaron was the opposite – he made everything he looked at and had this uncanny ability to make putting look like it was the simplest skill in the world. I suppose to Aaron it was, he looked at the hole, walked in, got comfortable and then stroked the putt. No fuss. No confusion. Me: Aaron, your putting is unbelievable. You make so many putts. AB: Thanks Cameron. Do you know who taught me how to putt? Me: No, who is teaching you? AB: Cameron, you showed me this putting style when I was 16. I have never changed it and probably never will. It works a treat and feels so comfortable to me. I was in shock. I remember helping Aaron around 1995 with some things but I had no idea he was crediting me with helping him turn his putting game from his weakest link to his strongest asset. This was the kick in the bum I needed. I almost immediately stopped feeling sorry for myself and starting acting like a kid who could putt. I stopped worrying so much about every single putt and even started accepting the odd miss. I certainly stopped beating myself up about it and went back to doing things I knew worked. Aaron helped me realise that I had the skill, talent and knowledge to be a better putter. I’m not going to say that my putting game improved immediately, it took a while, but I plugged away at things and bit by bit I became a guy who could make putts that counted. Virtually ALL the old time players had jabby putting actions as far as I can see. Its the natural thing to do when you want to hit a little ball a short distance with a long stick. Waving it in a big, slow sweeping motion is completely UNnatural. Pity you listened to that guy. Pity any of us listen to any of those guys who think they know our bodies better than ourselves. But there wasn’t one. There ISN’T one thats better than the one thats ‘you’. The damage these people do. They’re of course nowhere to be seen when the train wreck happens. What a sad story – and so common. Buyer beware I guess. GP: thanks for sharing your thoughts. I’ve read King’s book, On Writing. It’s superb and should be a must read for every school kid. Sadly, most kids get too caught up in all the technical aspects of writing and therefore don’t like to write. The system is broken that’s for sure and it’s unlikely to change. Adults also tend to be obsessed on the quick fix and miracle cure – but this isn’t how we really learn – sometimes we may get lucky but it’s fraught with disappointment. Watch, play and learn. It’s not bad advice if you ask me. Yeah, me! The saddest part of all is that when I actually “got it” I stared disbelievingly at what I was doing because it was WHAT I USED TO DO BEFORE I LISTENED TO EVERYONE ELSE! In other words, as Cameron says, its often already in you, you’ve just to uncover it. Back to the writing comparison for a moment: Stephen King says he thinks of stories like that, like fossils buried in the earth – they’re already there. His job is to uncover them and let them out. One thing that helped me peel away the rubbish that was covering up my natural swing was anger. I was SO sick of all the mucking around I actually went out and just started thrashing (in a controlled sort of fashion you understand, I didn’t want to end up in the casualty ward with a fractured spine!). The swing that appeared when I did that was my true, uninhibited, “belt a a rock with a stick” swing. It was pretty raw, and I’ve smoothed it down a bit since, but its essentially the same swing. Its how I swing anything – cricket bat, hockey stick, sledge hammer, carpet beater 🙂 Its what MY body does when it wants to hit something. Because its so natural it removes the need to make notes and remind yourself what you’re supposed to be doing (“hands like this, feet like this…”). Its a simple, ORGANIC motion (not a conglomerate of parts, ONE action) and its like walking – no thought required. You will have a swing in you like this too. You have to let it out as Cameron says. One of my other favourite writers says she always tells her students to “write recklessly”. Another one tells his students to “give yourself permission to write badly”. They’re talking about the same thing – the thing I gave myself permission to do when I got angry and went out and thrashed away. What they’re really saying is “don’t be outcome focussed”. Write for writing’s sake, swing for swinging’s sake. And remember: you can’t hit a good shot until you don’t care if you hit a bad one. Think about that. There’s gold in it.